Neva Masquerade Cats are a breed of Sibierian cats, from Russia. Read more about the breed itself and why it is such a delight of sharing our time with them. This gorgeous cat breed, known as the Siberian cat, exists around 1000 years, as far as we know. By reading and listening to the old Russian fairy tales about the Cat Bayun, it becomes clear that the cat described has to be a Siberian. Therefore, we like to say that this is an ancient cat breed. However, the first written description of the Siberian cat can be found in the book from Harrison Wier “Our cats and all about them”, published in 1889. Officially, the Siberian cat is accepted by TICA (The International Cat Association) in 1996, followed by FIFe (Federation Internationale Feline). WCF (World Cat Federation) accepted it in 2002 while CFA (Cat Fanciers Association) waited until a few years ago. 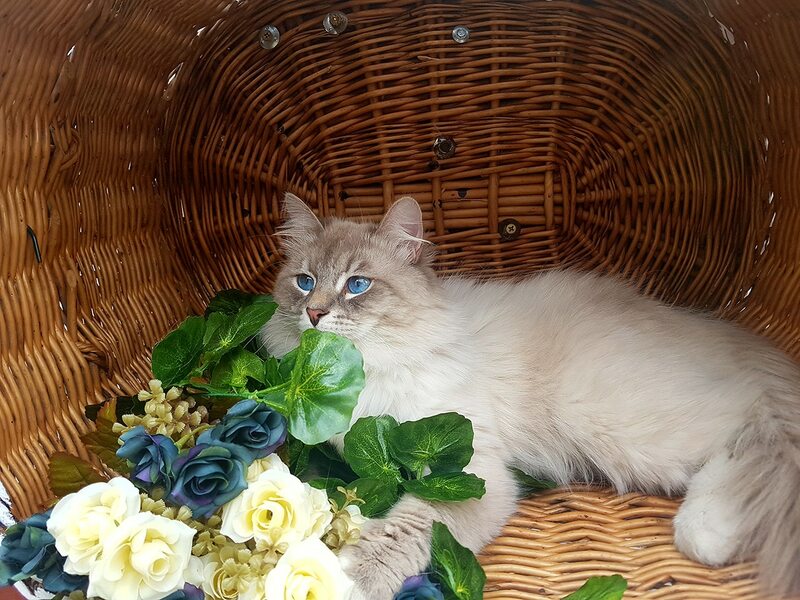 The Neva Masquerade is a unique breed of long-haired Siberian cats with color points and bright blue eyes. 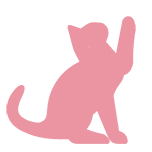 Colorpoint is a specific kind of color combination where the “points” of the body, such are muzzle, ears, paws and the top of the tail, are darker than the rest of the cat’s body. 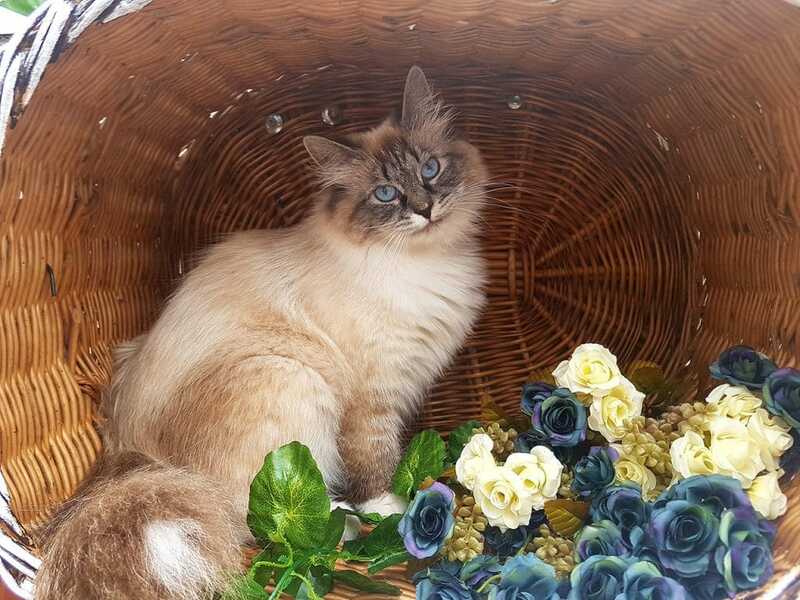 Only Siberian cats with such color points are known as Neva Masquerade breed, which is deemed as the highest achievement of careful breeding selections among felinologists. Siberian cats are easily distinguished by the muscular body, broad bones. Their hind legs are longer than the front ones, which makes them excellent jumpers. You’d never imagine with what virtuosity this, generally big cat, cam jump with! Their athletic bodies allow them to have almost perfect balance accompanied by great strength to overcome even the hardest tasks. This breed is known by very slow maturation, as well as growth and development. In order to grow to full size and reach maturity, they tend to take around 5 years. Their fur is semi-long, three-layered, waterproof. Its thickest area is extending from the neck all until the long, lavish tail, which they use to further warm up by wrapping it around their paws and face. Exceptional dense fur makes them tufted even during the summer molt. However, they require only one weekly brushing to remove the dirt and dead hair in order to keep their well-known shiny and healthy appearance. Thus, these cats do not require frequent bathing because their thick hair does not allow the dirt to pass through, to the skin. Their paws are equipped with furry growths that ease walking on snow and ice. Their heads have a rounded shape, proportional to the body. They’re characterized by cuddly faces with large eyes, slightly slanted towards the beginning of the ears. Their ears are medium-sized, rounded and discreetly inclined forward, with slightly pointed ends (“Lynx tipping”), which can be seen in wild cats and the lynx. This small detail undoubtedly gives them that special, wild and yet so gentle appearance. The chin is rounded, not protruding, and in line with the nose. The muzzle is short, full and rounded, while the nasal curvature is not steep, and the transition between the head and the muzzle is very discreet. Since they were very large they reach significant weight: males weigh 7-10 kg, and the females are slightly lighter and can have 4-6 kg. Their necks are rounded, muscular and covered with thick mane-like fur which only becomes more pronounced with maturity. The body of Siberian cats is of medium length, muscular, with a rear end at a slight angle to the shoulder. Siberians have a strong stomach and very strong hind legs, which are used to jump to great heights. Neva Masquerade cats bear the name after the river Neva in northwestern Russia. This was the region where we’ve found the first specimens of Siberian cats with bright fur and tabby or point markings on the face resembling a mask. Their rich colors HAVE to be accompanied by blue eyes that range from light blue to dark blue. The most common fur color of Neva Masquerade is the seal, which can also occur in combination with silver or golden color. All permitted colors can appear with or without whiteness and in all textures, which are most prominent on the head, paws, and tail. Textures that occur in Neva Masquerade can be Point, Tabby, and Tortie. Dedicated effort of the breeders certainly aspires to separate the Neva Masquerade cats as a separate breed from other Siberians. Although appearing as very powerful, these cats are quite emotional and cuddly. Their calm nature ties them to the owner and not the house (which is rather odd in the cat world), and they are very prone to friendships with other pets. Nevas are very playful and enjoy their time with their owners. With the help of his extraordinary intelligence, Nevas see their tasks as challenges and solve them easily. They have a beautiful, gentle voice, and enjoy “talking” to the family members. They will always welcome you when you come back home and will enjoy hide and seek or fetch the ball, which they will gladly indulge in. They will follow you everywhere and accompany you in all house activities. Siberians will gladly spend hours enjoying a pat and chat with their favorite owner. Even when they grow up they are able to play for hours, with one another and with toys and so entertaining to entertain themselves and their human friends. One interesting fact about Siberian cats – they just love water! There’s nothing unusual if your charming Neva “dabbles” paws in a container with water or even find herself in a bathtub full of water! Genetic diseases are unknown with Nevas, thus making an extremely healthy and resilient cat breed. One thing is certain: life with the Siberian cat is much different and more fun, fulfilling and very soon you will realize that you have beside your best friend, confessor and tireless entertainer! Bastet Beauty, Proudly powered by WordPress.